Leah McSweeney and Jacob Siegel have a splendid investigative report at Tablet magazine - “Is the Women’s March Melting Down?” - on the capture of the “Women’s March” by a band of racial go-getters, and the movement’s subsequent and ongoing crackup. Here is an abundance of insights into the pitiless struggle for predominance, celebrity, influence and wealth at the glamorous high end of the American progressive activism industry. The Women’s March got its start with an assemblage of mostly upper- and middle-class white female Hilary Clinton supporters - lawyers, corporate executives, business owners, fashion designers, online media operators and such – outraged by the election of Donald Trump and organized around the ‘Pantsuit Nation’ Facebook group. These well-heeled white liberals made a mistake that was perhaps inevitable but, in the event, also lethal. Slaves to identity politics and the need to tick intersectional checklists, they felt “their nascent women’s movement had to substantively include women of color.” The operative word is “substantively.” It was not enough that millions of women of all skin colors might march against Trump for political reasons. A few of those brown and black faces were also indispensable to help front the operation. Here the ladies ran into a problem that may be common in this social class: they did not know any suitably eminent females of color. They “reached out” for help to, well, a white man, one Michael Skolnik. Not a problem, said Skolnik. His own non-profit, The Gathering for Justice could supply the very faces for the job. And so with the Fox Force from The Gathering for Justice, each adapted perfectly to the mission at hand. Here was Tamika Mallory – black woman! – Board member at The Gathering for Justice, and previously the youngest ever executive director at that old race hustler Al Sharpton’s “National Action Network.” Here was Carmen Perez – Latinx! – Executive Director of The Gathering, formerly of Barrios Unidos and “something of a Renaissance woman in modern-day activism.” Here was Linda Sarsour – hijab-clad Muslim woman of Palestinian origin! – Arab-American, Islamic, and Black Lives Matter activist. Let’s review the social forces gathered onstage at this point. Over here are a group of highly educated and accomplished white and Jewish females, successful in business, the professions, and the arts, but mere amateurs politically. Call them the Lambs. And over here are the Foxes, of the desired racial derivation certainly, but with few academic or career accomplishments other than lives spent clambering up the ladder in American race grievance politics: political pros in short. The Lambs looked on the Foxes and cried “Sisters!” The Foxes looked on the Lambs, and they felt hungry. “It was there—in the first hours of the first meeting for what would become the Women’s March—that something happened that was so shameful to many of those who witnessed it, they chose to bury it like a family secret. Almost two years would pass before anyone present would speak about it. The ‘black antisemitism’ with which the Foxes went after the Lambs is, seen in context, a weapon, a power move in the factional struggle for predominance and resources within the American progressive movement, to settle who owes what to whom. 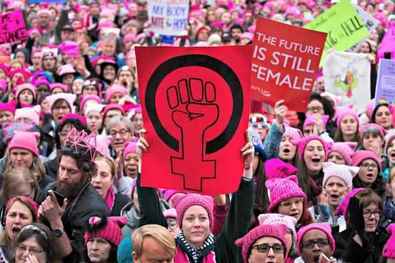 It was a bludgeon to psychologically and ideologically stupefy, intimidate, disarm and overwhelm the naïve white liberals of the Women’s March. Message: it is past time for Jews to join whites in American progressivism’s big tent of collective racial guilt and shame. You owe us too! Translated: back off white and Jewish ladies! More for Carmen, Tamika and Linda Sarsour! Vanessa Wruble had been the movement’s most important operational leader from the start, and the one who had reached out for help finding the Foxes. But by the end of January 2017 she was out. The Foxes brought in the top corporate law firm of Skadden Arps to further nail down control, setting up a new and opaque tax-sheltered non-profit structure. McSweeney and Siegel use much of their article to puzzle over these “complicated financial arrangements, confusing even to experts,” but in the end remain uncertain about how much money flowed into the Women’s March and where it went. A couple of points stick up out of the fog though. On the one hand, at The Gathering for Justice, the Foxes’ home base, revenues “increased by more than six times between 2016 and 2017, from $167,021 to more than $1.8 million.” On the other, the hundreds of grassroots chapters of the Women’s March around the country appear to have received not one dime from the central organization. Well, the Foxes wouldn’t have had the time to answer emails, would they? They were too busy harvesting the other sweet fruit of their activism – celebrity. "...the ribald combats of demagogues, the exquisitely ingenious operations of master rogues..."
It’s when I read tales like this, of how Fox Force Five became the World’s Greatest Leaders, that I fall to my knees and thank God for these our blessed United States.